Sometimes art takes you in a different direction than you had originally planned. 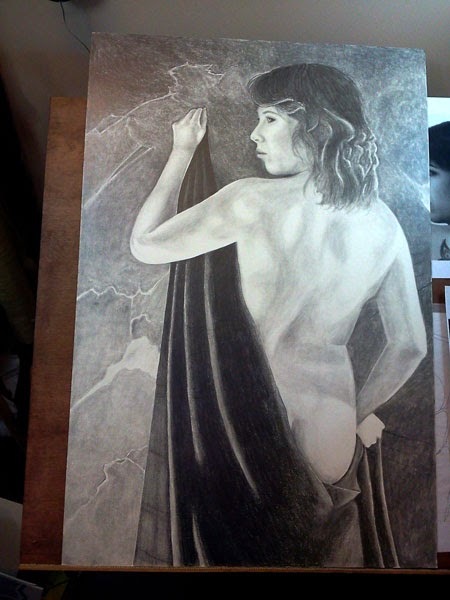 In my last post I presented a reference photo and had created a preliminary sketch on paper to begin a pencil drawing of the female form. That project sat for a long time and I never completed it. There was always something that kept me away from it. Other projects, other interests (roller derby being one of them) and basic life in general pretty much kept me away from art for several months. Then I read a book by Jacqueline Carey called Kushiel's Dart. I became completely enraptured with the main character of that book, Phedre no Delaunay. 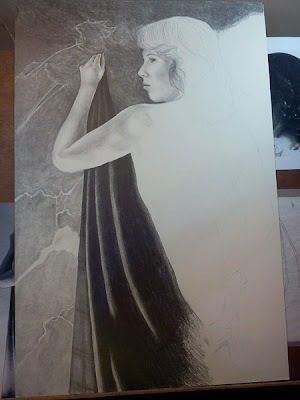 One day I was looking at the original photograph that I had taken of my model, Tamara Tenny, and I realized that I was looking at a photograph of Phedre. Everything from the curve of her back to the expression on her face was that character to me and it dawned on me that as I had been reading, I had been seeing her in the character. That, for me, is where technique moves into the realm of art. I could no longer be satisfied with simply creating a drawing that demonstrated technique. I had to create the character that I had become so obsessed with. I had to create a work of art that brought about the same emotion in me that I experienced while reading the book. So, I started over. There was no way I could express what I wanted in a work that was only 11x14. So, I searched my stash and found a sheet of 20x30 cold press illustrator board that would work perfectly. It's smooth finish was ideal for the techniques I use and with that size, I would be able to capture that beauty that was the character. Not only the physical beauty, but the beauty of her personality. Kushiel's Dart is set in a mythical world several hundred years ago. The kind of wall that my model was standing against is not appropriate for that time period. It is also not appropriate for the upper class world in which the character existed. My original thought was to have her standing in front of a marble pillar that would be illuminated by the light at the lower left but fade into blackness on the right. But the more I studied the work as I was creating it, the more I realized that too many things would be lost in the contrast of the darkness against her hair and that contrast with the body being lit from the distant light source on the right would be way too much. So, instead of a marble pillar, I decided to go with a solid marble wall. A Google image search brought me several options that I could choose from, but none of the results were really what I was looking for. In the end, I simply created my own marble based on many of the images that I had found. 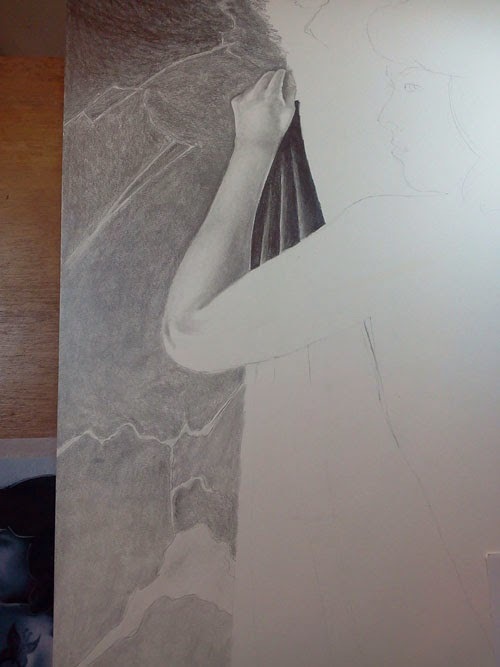 I began by sketching in some of the striations and deformities that would be inherent in the marble. 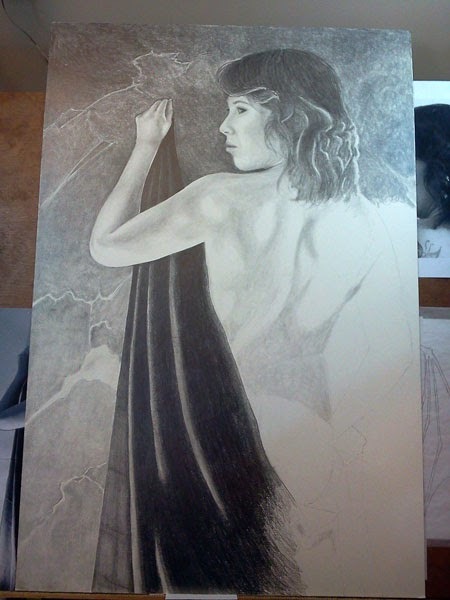 Then starting in the lower left corner I began VERY lightly laying in some graphite, making sure that there was a lot of variation in the level of intensity (for more information about my techniques in laying down graphite and using the tortillion, please see my Lessons page.) Once the graphite was laid down, I used a medium sized tortillion to smooth and blend the graphite to create a line free depiction of a marble wall. I normally start a portrait from the eyes and work my way out. But since this one was so large, I was afraid that if I did not work from left to right, I would end up accidentally damaging work by laying my hand on a finished area. 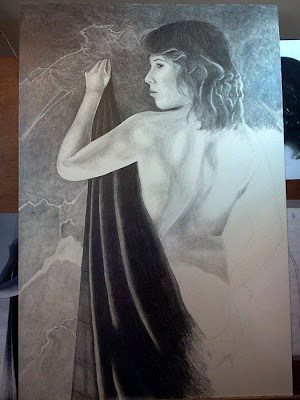 I also wanted to make sure I utilized the same light source in the finished piece as I did in the photograph. In the photograph, the light was coming from a directional lamp that I had on the floor pointing up. My vision of the drawing is that she is standing near a fireplace and the illumination is coming from the fire. There is not much to tell about the following images. If you have followed my lessons in the past then you know that I do not draw objects or people. 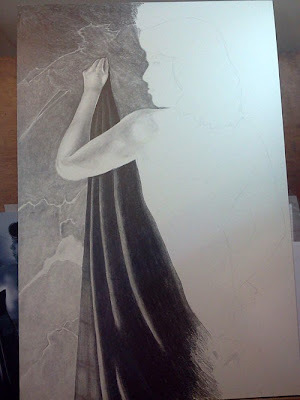 I simply recreate lights and shadows using graphite. 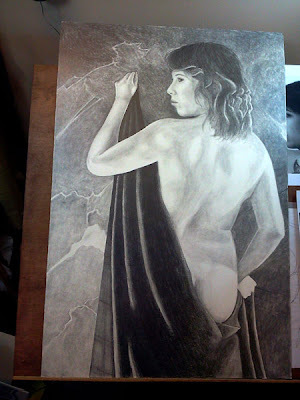 For the lighter areas I used a Derwent 2B woodless graphite pencil and for the darker areas, like the drape she is holding and her hair, I used a Derwent 6B woodless graphite pencil. If you have any questions about anything you see here, please email me and let me know. Or comment on this post. The last thing to do for this project was to create the tattoo that is a very important part of the story of Kushiel's Dart. The problem I ran into was that I did not agree with the publisher's official design. To me it did not evoke what was described in the book. So, I decided to create my own tattoo design based on what I saw while I was reading. "With some effort, I recognised the underlying design, which was based on a very old pattern, the briar rose. Somehow Master Tielhard had kept the dramatic vigor of the archaic lines, yet infused them with a subtlety that spoke at once of the vine, the bond and the lash. The thorny lines were stark black, accented in only a few choice hollows with a teardrop of scarlet - a petal, a drop of blood, the mote in my eye." 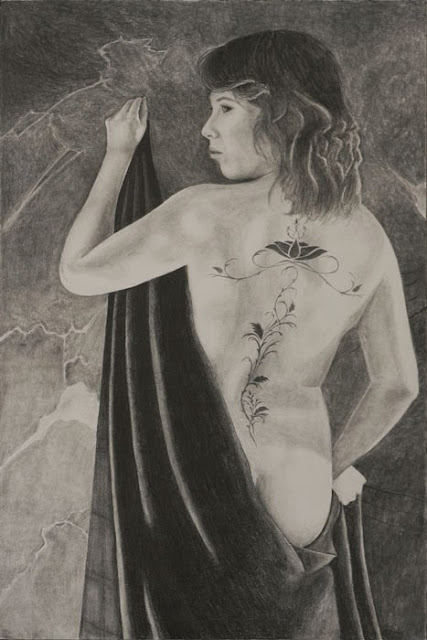 The following image is the completed piece with my own version of Phedre's Marque. There are a few things that I am passionate about. The arts are among those things. So, I spend most of my time either enjoying or creating works of art in one form or another.